12 p, col. ill. :21 cm. Your friends' eyes will sparkle when they discover the magic of making pysanky at your birthday party. 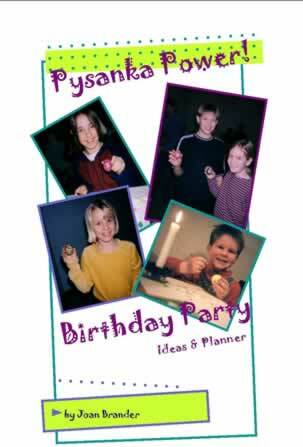 This book is full of ideas and resources to make your pysanka-themed party a smashing (no pun intended) success. Table of contents includes invitations, decorations, games, cake, snacks, favors, planner and more. Full color. Soft cover (12pp). The perfect partner to our Pysanky Party Kits. If you think that egg decorating is just for Easter, THINK AGAIN! Select this link to watch a Pysanka Power Video Clip that flips through the pages of Pysanka Power! Birthday Party Ideas & Planner. See the book format, pages, colourful cover, and contents of this booklet. Pysanka expert and best-selling author Joan Brander is an artist, author, instructor and lecturer who is at the forefront of preserving one of the great traditions of all time. Since learning the age-old tradition that was passed down through the generations from her grandmother whom she called "Baba", she has been passionate about advancing the culture and history of pysanky. 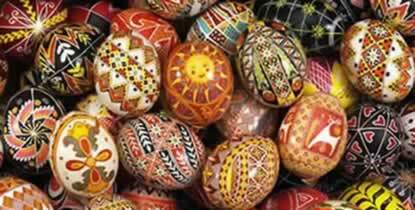 She loves sharing her skills and knowledge and has been teaching Ukrainian egg decorating to kids of all ages since 1991. An ancient legend says that as long as pysanky are being made, evil shall not prevail over good in the world. Joan is committed to saving the world . . . . one pysanka at a time. Select this link for her biography and accomplishments. Select our Contact Us link to contact or connect with her. Use the "Notes" section in your online checkout process to request that your book be autographed by the author or a personal greeting written.